Building on the award winning Speed app for webOS. Speed Gauge has been released on the Android platform. Featuring the same high-end automotive gauge look as the original”Speed”. Speed Gauge includes configurable layouts, background, MPH/KPH, and number of decimal places. Screen shots in our app section. Version 1.2 added heads up display (HUD) options for all layouts. Speed & BubbleWrapLite – Winners in Palm Hot Apps Contest! Speed and BubbleWrapLite were both winners in the 2010 Palm Hot Apps contest. Speed (a GPS speedometer) placed in the paid apps category and BubbleWrapLite placed in the free apps category. Thank you to all who purchased or downloaded these apps for making them winners! 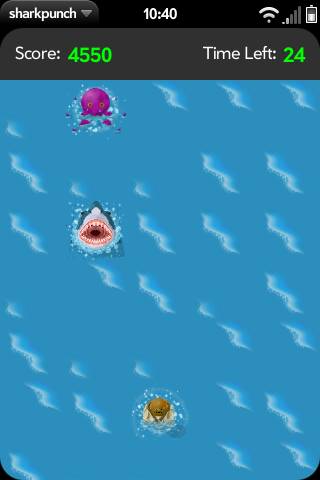 Tap the Sharks, Octopi, and Squid to defend yourself and the other marine life for points! 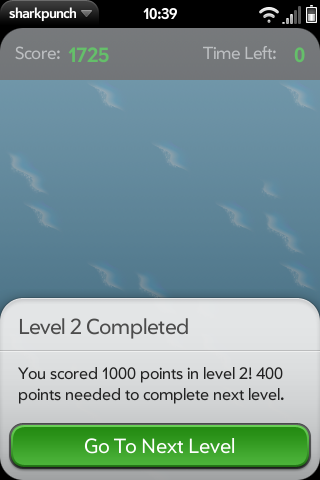 Each level has a minimum point goal you must reach before you can get to the next level, after that you can breathe easy and rack up more points in your leftover time. 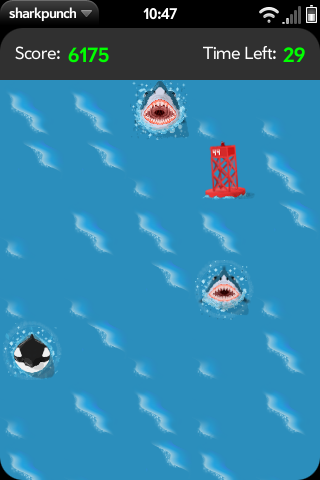 If you do happen to hit the other sea creatures or bouys, you’ll lose points. Try to top your personal high score while trying to conquer all 20 levels! A new app from Fridayapps.com… Calendar Weather is a unique app that uses Palm Synergy to put the National Weather Service US forecast for your zip code on your calendar. We wrote this app because we wanted it to have it on our devices. Make planning your day and week easier when you are not jumping back forth from Calendar to weather apps…..
SpeedCheck 1.0.2 is now available in the application catalog. Increases the selectable Speed limit settings and improves the changes from MPH to KPH. Speed 1.2.5 is now published in the App catalog. 1.2.5 includes a much improved German translation. Many thanks to Speed app user Ralf for providing the revised translations. Speed 1.2.4 is in Palm review. This version includes additional Palm GPS status verification for acquisition and during normal operation. Basically tells you when the Palm GPS has stopped responding and you need to bounce the app, your settings, or restart your phone…. Also includes French, German, and Spanish support for the app. Translation assistance, If you are bi-lingual and see any phrases that need improvement, (or are willing to review a list of phrases), the please send us a note at info@fridayapps.com.